We are manufacturers of Fabrics. The Sanganeri Block Print Cotton Fabric we offer is widely acclaimed amongst the clients for its availability in designs, colours and patterns. 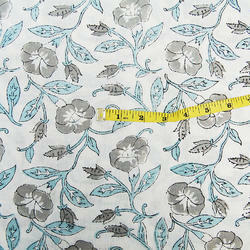 Offered Cotton Fabric is known for its colourfastness nature and can be washed easily.We are manufacturers of Fabrics. The Sanganeri Block Print Cotton Fabric we offer is widely acclaimed amongst the clients for its availability in designs, colours and patterns. Offered Cotton Fabric is known for its colourfastness nature and can be washed easily.